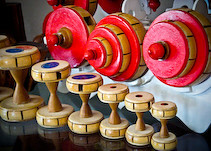 Families have used yo-yos for fun and recreation for over one thousand years. Although they are called “yo-yos” in the West, the traditional Chinese name for them appropriately means “empty bamboo.” While yo-yos were originally made solely from bamboo, other materials are often used now. Zhang Guoliang learned to make yo-yos from his family and is a third generation artist of the craft. 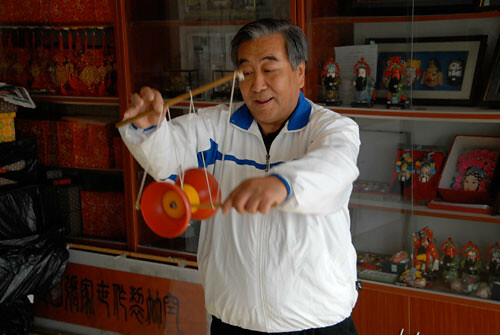 Zhang makes yo-yos with one and two wheels, and some of his yo-yos have perforated edges that create a whistling sound.